Social pressure can heat up really fast if you have taken on changing your life in a way that is very different from those in your life -- your family, friends and coworkers. They may not be thrilled with your lifestyle changes and can present a lot of discouragement, even if they are well-meaning. When embarking on a new eating plan or a program, all the hinderers and saboteurs in your life seem to come out of the woodwork! Social pressure can heat up really fast if you have taken on changing your life in a way that is very different from those in your life -- your family, friends and coworkers. They may not be thrilled with your lifestyle changes and can present a lot of discouragement, even if they are well-meaning. "You don't like the food I made?" "A little bite won't hurt you." "There is no reason to give up wheat/gluten, it's good for you." You do not have to make a choice between your commitment to your health and your social life. A few simple tips and strategies can support you in eliminating the sugars, refined grains and processed foods that are negatively impacting your life and not live on a deserted island while doing so. In an ideal world, everyone you know would be on this journey too. They would all be determined to embark on their healthier life. You would all encourage each other and get through it together. In reality, this is not the case. Thinking you will be able to eat every meal alone is probably unrealistic as such a large portion of socializing involves eating and drinking. This is further confounded when the people you are socializing with knew you before you decided to change your relationship with food. It is important to equip yourself with a few skills to navigate the family dinner or happy hour with friends. Here are my suggestions and ground rules you can use and adapt to avoid allowing all that social pressure to get to you and sabotage your best efforts. In order to get some support from those in social situations, you need to be an advocate for yourself. It is important to take your commitment to your diet seriously. If you keep undermining yourself (with a bite here and a slip there), you will be less likely to be taken seriously. Be clear about your guidelines and what you can, and cannot tolerate. Not making a big deal about the foods you are eliminating and avoiding will often times allow you to go about your meal while drawing minimal attention to your new dietary habits. We are all well aware of the feelings we have towards the person who always creates drama around what they can and cannot eat, having ethical or philosophical discussions around it and implying we are all wrong and sinful for not following their nutritional ideology. This can be highly annoying and a good lesson in what not to do. Be polite, say "no thank you" and continue with your social function. Not making a big deal out of what people you care about are eating may be a little tougher. 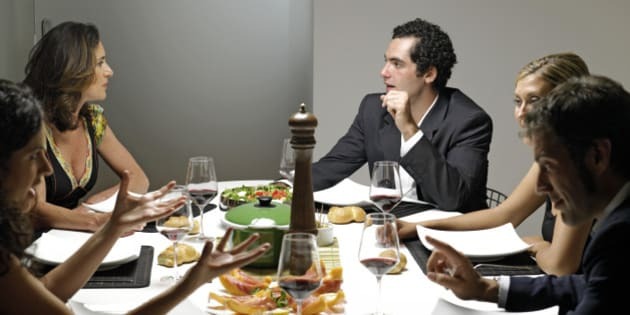 Defending your new food choices or limitation can create much social anxiety. For situations like this, a short, one or two sentence explanation is all that is necessary. Keep it memorable and practice it so that you can say it with confidence. You have a right to your choice, explain and move on. If a person will not let it go and keeps insisting on further engagement around the subject, repeating "it works best for my health" is often a tough statement to argue with. You can plan social events to get together with others that may not involve food and alcohol. Take a walk, meet at a coffee shop, play a game of mini-golf or anything else that you rarely do as so many social activities revolve around food. Inviting family and friends over for dinner is another surefire way to avoid awkward situations when refusing a dish and it will allow you the opportunity to show off some of the delicious new recipes you have mastered. You have all this newly acquired information about nutrition and the effect of certain foods on your body. You want to tell everyone. This is important stuff, and if they knew, they would join you. No matter how pure your intentions, others will often misinterpret your enthusiasm as you being judgmental or condescending. Food is extremely personal and such a delicate topic. Discussing your new choices may make cause someone else to get really defensive. The best and easiest solution is to lead by example. When you make the right choices and start feeling and seeing your positive results, some people will become curious and ask how you look better, feel better, have more energy and seem happier. I know that eliminating social pressure completely is unrealistic but you can choose to avoid many situations where that pressure negatively impacts you. In exchange, you can choose situations and individuals to surround yourself with who can both support you and keep you accountable to your goals. This type of positive social pressure makes you more likely to stick to your commitment, even when you are having a tough day. Communities of like-minded people, in person or online will also provide positive examples and re-enforcement of your health goals. Patience is important. One of the hardest parts of embarking on a new lifestyle is getting you and everyone else accustomed to your new (and possibly strange) food choices. Unfortunately, it is unrealistic to expect to win everyone over. There will always be that one person insistent on trying to derail your new lifestyle choices. They will never be part of your cheerleading squad and that is perfectly fine. The focus should always be on what you are able to control -- you and your commitment to your health. You may want to limit your interactions with those who are excessively critical or judgmental -- your health is always worth it.